The Premium plugin gets you the Nutrition Label feature, but you'd have to fill in the values yourself. With the Pro and Elite Bundle we integrate with a Nutrition API to help calculate those values for you. Where are these values coming from? We integrate with (and pay for) the Spoonacular API. Take note that the Nutrition API only supports English ingredients at the moment. You can still use this feature, but you’ll have to manually match every ingredient with an API product by searching for the English name. You'll only have to do this once per ingredient. Next time you use the same ingredient it will remember the API product you picked. It's also possible to define custom nutrition ingredients if you have something specific to use or can't find an ingredient in the API. Click on that blue button to start the calculation process. The next screen you see lists all ingredients in your recipe and automatically tries to match them up with an ingredient in the API. Click on a matched ingredient (or on "no match found") to manually search for a better match. 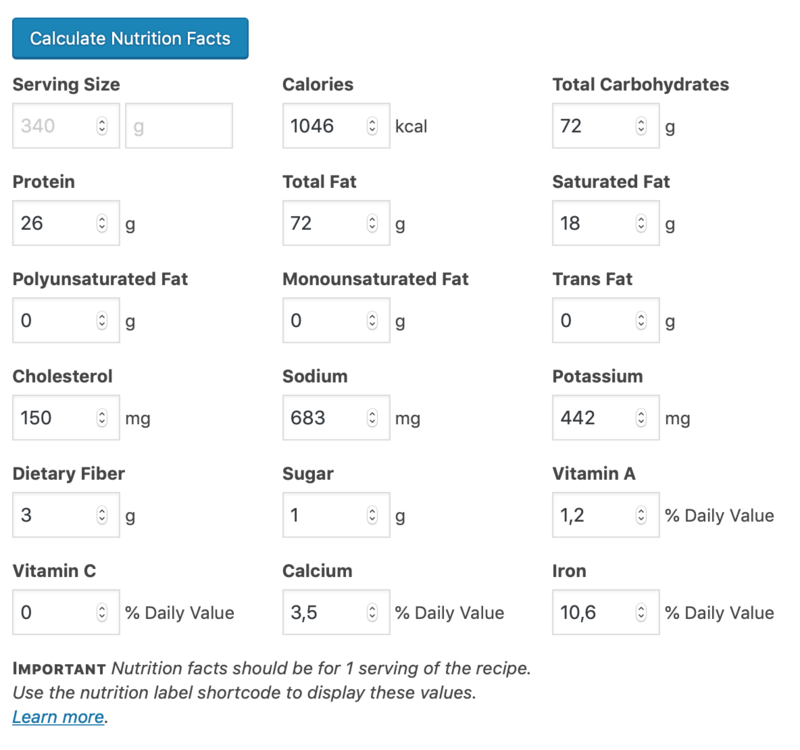 If you're happy with the matched ingredients, just click on the "Calculate Nutrition Facts" button again and wait for the API to fetch all the values. The next screen will show the values the API retrieved per ingredient. 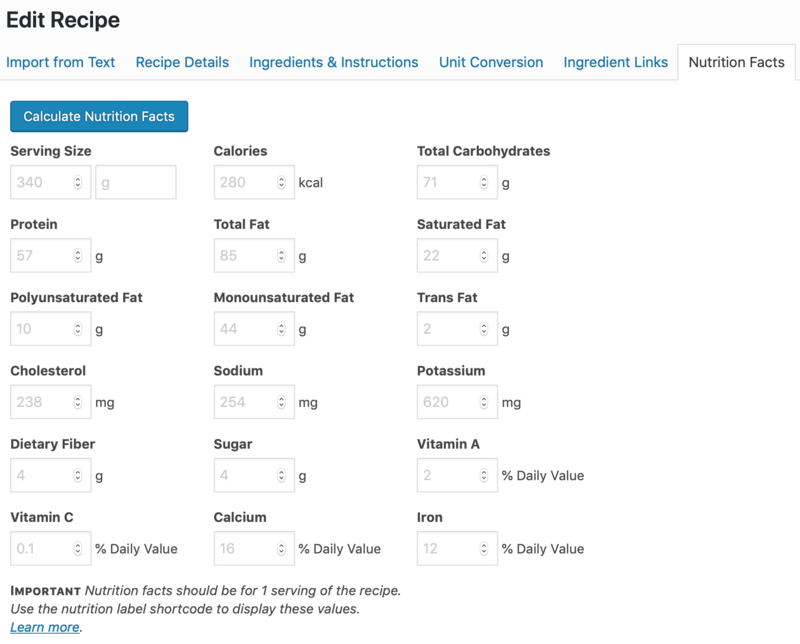 You can make any manual changes you want here by clicking on the nutrition values for an ingredient. You can make manual changes here, if required. Why doesn't the serving size get calculated? The serving size would be the weight of 1 serving. This heavily depends on how the ingredients are prepared, so it's not possible to automatically calculate those values. You could manually add that in, if you want, but it's not required.